It’s amazing how much people like smashing things. I remember years ago when I was involved in renovating an old house for the House of Hope mission that I worked for in St Kilda before I came here, there was lots of work to do and most of it was done by volunteers. The one day on which everyone was queuing up to volunteer was the day we were going to knock a wall down. I would confidently bet that when we finally do the renovation of the church kitchen in a few months time, we will have plenty of volunteers to help smash up and remove the old cupboards. Even people who don’t otherwise seem to have violent bone in their bodies seem to relish the idea of taking up a sledge hammer and smashing something down. This begins at an early age. I remember when my daughter was about two or three, she liked stomping on sand castles even more than she liked building them. Unfortunately we don’t seem to have quite the same instinct when it comes to the walls of suspicion and hostility that divide people from one another. People were a lot more eager to pull down the physical Berlin Wall than they were to truly reconcile the peoples who had lived on opposite sides of it. The task of rebuilding a single society with justice and equality for those from either side is still a work in progress. We in Australia certainly can’t point the finger on that one. We don’t have the symbol of a wall on our border, but that’s probably only because we don’t have any land borders. Our borders are the ocean shore, but they are being patrolled just as determinedly and harshly as the USA/Mexico border, and with the same aim of making sure that poor and desperate people cannot cross and seek asylum among us. In some parts of Australia the level of suspicion and hostility between black and white communities is as bad as any ethnic conflict anywhere in the world. The gap between the standards for indigenous and settler peoples for things like infant mortality, malnutrition, preventable illnesses, unemployment and imprisonment are among the most extreme in the world. We might not have built a physical wall, but the division in our society is deep and high and wide. We in white Australia have learned to speak the language of reconciliation but we’re very resistant to backing it up with money and action. The passage we heard read tonight from the letter to the Ephesians describes Jesus as being on a mission to break down the dividing walls of hostility in order to make one new united humanity. It’s clearly a task with a long way to go. In this passage the discussion is about breaking down the barriers between the Jewish and gentile communities of the first century, but that certainly doesn’t mean that it stops there. It is worth us having a good look at what was said though, because this is the barrier to which the New Testament gives the most attention and the principles developed there will be likely to have important consequences for addressing the divisions we face now. The letter describes the division quite clearly. One group had access to a rich heritage of ways of relating to God. The sacred alliance between God and Israel was built on generations of understandings and promises and mutual obligations. The other group had no access to this heritage. They were groping in the dark when it came to finding ways of making contact with God. Jesus wanted to make one new humanity out of the two groups, but he recognised that Israel’s pattern of relating, which had evolved into a complex set of rites, regulations and cultural mores, was no longer capable of being really inclusive. It was no longer something that could really function as a light to the gentiles and thus draw all people into the sacred relationship. So, according to Paul, Jesus did away with it. He abolished it as a way of relating to God. In its place there is a new way of gaining access to God for everyone – through Jesus Christ in the one Spirit. This new way of access has been made possible by Jesus, and at no small cost to himself. He got crucified in the process of establishing it, but he established it anyway. Paul hammers the point that God did this with both groups equally in mind and that now we must both walk the same path if we wish to have access to God. That, he says, should be a good enough enough basis for reconciliation between the two groups! The principle the letter argues for then is that our attitude to others should be shaped by God’s attitude to them. And when we recognise that God in Christ loves us equally, includes us equally, suffers for us equally, and offers Godself to us equally, then who are we to start treating one another unequally or even to tolerate existing inequalities between ourselves? There is even an illustration that we can easily relate to our contemporary national and political life – the illustration of citizenship. We know that foreigners in a country don’t have access to all the same rights as the citizens of that country. You can’t just lob in here from another country and apply for an Australian pension or expect to be able to stand for election to our Parliament. Only Australian citizens have guaranteed access to such things. Well, Paul picks up this idea and says that because of Jesus we are now all citizens of the province of God. There is no hierarchy based on where we came from or even how we have behaved. Paul the Apostle, Brigit of Kildare, Francis of Assisi, Dorothy Day, and you and me all have exactly the same right of access to God and we all have to do it the same way – through Jesus Christ in the one Spirit. Now please note that this isn’t just a theoretical equality with no social implications. Paul is not just saying that God treats both groups equally. He is also saying that because God treats both groups equally, the dividing walls of ignorance, suspicion and hostility between us are now an abomination and should be torn down. 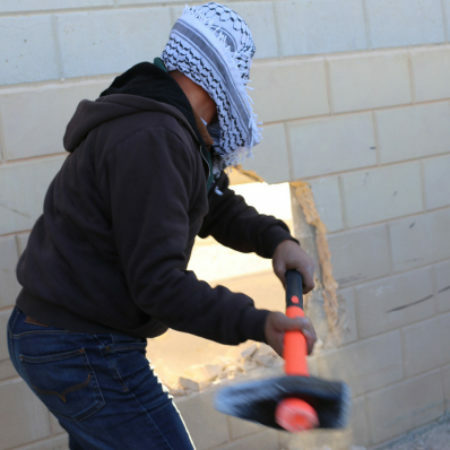 Jesus the sledge hammer champion has not only demolished the walls the divided us from God, he now wants to do the same with any walls that divide us from one another. You can take this principle and shine it like a spotlight on pretty much any division among people that you care to name. In the first century the Jewish/gentile divide was the big struggle. It took the church the best part of the century to sort it out, and it seems that Israel still hasn’t resolved it. The Israeli parliament has just passed a law that gives its Jewish citizens different rights from its Arab citizens. The walls of hostility are still being built and reinforced. Paul, in his letter to the Galatians also pointed out that the divisions between slaves and free, and male and female would have to be similarly addressed. It’s somewhat embarrassing to think about how long it took the Church to address them, and our Baptist Union here in Victoria is presently grappling with evidence that we have been going backwards again on the equality of women. The Apostle James, in his letter, focussed more attention on the divide between rich and poor. Nearly twenty centuries later we’ve still got a long way to go on that one. But we’ve got still more divides that we can shine the same spotlight on. Many of them were barely imaginable when the letter to the Ephesians was written, but the principle works in exactly the same way. God in Jesus loves indigenous Australians and incoming Australian equally, suffers for them equally and gives them access to God in the exactly the same way. So isn’t it time we took a holy sledge hammer to the walls of hostility and ensured equal opportunities for both within our church and within our society. God in Jesus loves born-&-bred Aussies and asylum seekers equally, suffers for them equally and gives them access to God in the exactly the same way. So isn’t it time we took a holy sledge hammer to the walls of hostility and tore down the barbed wire and ensured equal opportunities for both within our church and within our society. God in Jesus loves heterosexual and homosexual people equally, suffers for them equally and gives them access to God in the exactly the same way. So isn’t it time we took a holy sledge hammer to the walls of hostility and ensured equal opportunities for both within our church and within our society. And a note of caution before I close, because I know that most people in this church are just nodding in agreement with all this and thinking that we’re doing better than most. And perhaps we are, but we humans are extremely good at erecting social barriers, and we have a tendency to erect new ones as quickly as we pull old ones down. This characteristic has been as evident in the history of the Christian churches as it has been anywhere else. The history of hostility between various denominations or between the champions of particular opposing theological traditions is a sad and ugly legacy. And just because we are more ecumenically minded nowadays doesn’t mean that we’ve mended our ways. The divisions between fundamentalists and moderates, between pentecostals and traditionalists, etc etc are no better. In some ways the danger for a church like ours is even greater than it is for many others. We have embarked on a course that is different than most other churches in our denomination and indeed in the wider Church. We believe that we are faithfully following Jesus in pursuing an alternative style of worship and a somewhat non-conformist policy of social inclusion, and we feel good about it. We believe we are right and that what we are doing is good, better even than most of what we see around us. Well, that is okay, but it’s very easy to slide from there into looking down our noses at others and thinking that they are not as good as us, not as Christian as us, not as faithful to God as us, and eventually not as pleasing to God as us and not as loved by God as us. And whenever we start sliding into that kind of attitude we can expect a loud crash on our tightly closed door from Jesus the sledge hammer champion!